Angeles Perez, Reynolds Elementary School principal, is excited about receiving a Spring ISD Education Foundation Grant Express check. HOUSTON – Dec. 6, 2018 – Teachers at some Spring ISD campuses got an early holiday surprise on Wednesday when the Spring ISD Education Foundation entered their classrooms, bringing funding for innovative learning projects. “The eyes on the teachers when we come through and the students when they see us coming down the hall is just phenomenal,” said Spring ISD Education Foundation President Ken Grays. He said the annual event, also known as the Grant Express, is an exciting way to celebrate teaching and learning. Departing the Gordon M. Anderson Leadership center on Wednesday morning in a school bus, some 17 members of the foundation visited nine Spring ISD campuses delivering nine checks totaling over $45,000. David Crawford, foundation member and member of the first graduating class of Reynolds Elementary, was especially excited to present the school with the check in memory of his mother, Dorothy Crawford, who was a teacher at Reynolds Elementary for 20 years. At Claughton Middle School, Terrance Bircher, a Positive Approach to Student Success (PASS) special education aide, plans to use his grant to purchase new DJ equipment. After seeing an interest from his students, he is hoping the equipment will bring his students the opportunity to learn a new trade they can use inside the classroom. “I’m speechless,” said Bircher when the Grant Express arrived to his classroom to deliver his check. 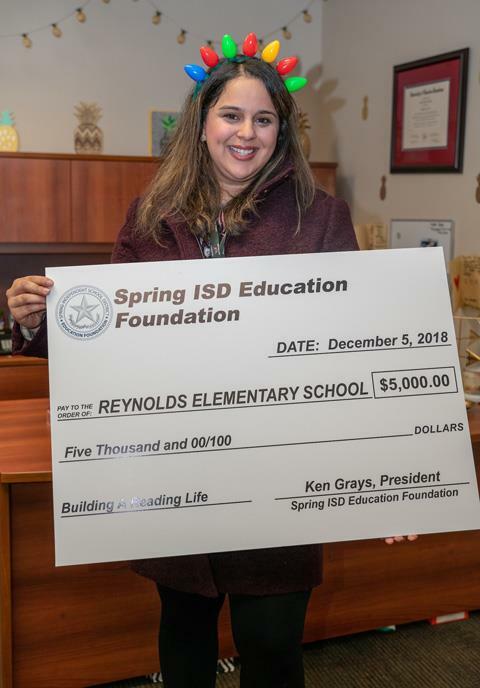 Reynolds Elementary received a grant for Building a Reading Life, a Pre-K-5 language arts program designed for nearly 800 students. Building a Reading Life is centered on the premise that through establishing the appropriate environment, literacy can be built and students can build their reading life. Students will be able to engage in meaningful discussion centered around literacy as well as engage in structured independent reading through their access to leveled, organized libraries. The application was submitted by Dr. Angeles Perez, Rebecca Perez and Nicole Sever. Claughton Middle School received a grant for 50 eighth-grade students involved in a new DJ Performing Arts program with the objective of developing students’ critical listening, analytical and technological skills. The equipment will offer students opportunities to learn fundamental concepts and terminology necessary to establish a strong foundation in performing arts. The application was submitted by Terrance Bircher and Melody Lunenburg. Heritage Elementary Characters Like Me, will provide students with a chance to experience literature through a new lens. In alignment with Spring ISD Guiding Principles, literacy is the foundation for academic success. The use of text with authors, illustrations and characterizations that is familiar to scholars will make text-to-self and text-to-world connections make sense. The application was submitted by Quasha Monique Furr. Anderson Elementary received a grant for Flexible Seating for Flexible Minds, which will provide flexible seating for students that struggle with staying on task in the classroom and to help stay focused during instruction and ultimately be more successful in the classroom. The application was submitted by Sharon Stryjewski and Katie Lopez. Hirsch Elementary received a grant for Bits and Bots, a bilingual fourth- and fifth-grade math and science, and robotic coding club that introduces students to the concept of coding and robotics. Students have the opportunity to learn that anyone can code. The application was submitted by Nancy Gealow, Jacqueline Moreno and Alejandro Urquides. Each Spring ISD middle school — Bailey, Bammel, Claughton, Dueitt, Roberson, Twin Creeks and Wells — received a grant for Traveling Culture Trunks, which will provide students with a trunk filled with a variety of items that will engage students with the Texas Essential Knowledge and Skills (TEKS). These experiences will bring history alive so that students will be able to see and understand the relevance of what is being taught in middle school. The application was submitted by Michelle Neyrey, Susan Pelezo, Eboni Jeanerette, Stephanie Powell and Kenisha Williams. Spring High received a grant for two organizations—Lions Den and Paxton/Pattersons Health Science College & Career Ready Lab. The Lions Den, which received $4,100 in grants, is designed to encourage 500 new and current students in the Career and Technical Education (CTE) Business Pathway to learn how to operate a school-based enterprise. For many students, this project will provide them with first-hand and real-world experience beyond the traditional classroom setting. The application was submitted by Dr. Christina Hinkson, Dawanda Richard, Daniel Lucas, Carla Denney, Toshira Gouard and Nicholas Powell. The Paxton/Pattersons Health Science College & Career Ready Lab received a $5,000 grant to provide a project-based personalized learning environment for students that includes content delivered through media, writings, and printed materials; and components for activities, college and career research that is 65 percent hands-on. The foundation skills of Spring High School students are reinforced through reading comprehension, math and science connections, and critical and narrative writing activities. The application was submitted by Dr. Valerie Chin, Jennifer Stanfield, Candice Gaither-Sykes, Jennifer Cathey and Tiayannia Polk. Dekaney High received a grant for five students within All Abroad, which will provide funding for a new study abroad program at the school. Immersion is arguably one of the most effective ways to successfully acquire language and enrich oneself with the vast world outside of one’s own. This grant will provide resources for students, who would not have the means otherwise, to travel to neighboring cities and states, and expand their knowledge of other languages, people and cultures. The application was submitted by Jaleesa Brown. Westfield High received a grant for Tech Me Out! The project is focused on producing stronger student outcomes and achievement on the Biology STAAR End of Course (EOC) assessment by using the “ALL In Learning” system. Tech Me Out! will provide meaningful ongoing data analysis for the Westfield biology team to use for targeted instructional planning and interventions. The application was submitted by Qwendalyn Grant.